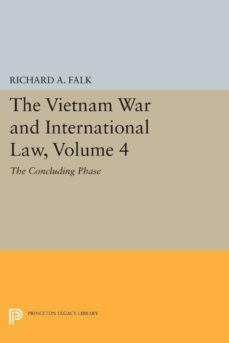 This concluding volume of The Vietnam War and International Law focuses on the last stages of Americas combat role in Indochina. The articles in the first section deal with general aspects of the relationship of international law to the Indochina War. Sections II and III are concerned with the adequacy of the laws of war under modern conditions of combat, and with related questions of individual responsibility for the violation of such laws. Section IV deals with some of the procedural issues related to the negotiated settlement of the war. The materials in Section V seek to reappraise the relationship between the constitutional structure of the United States and the way in which the war was conducted, while the final section presents the major documents pertaining to the end of American combat involvement in Indochina. A supplement takes account of the surrender of South Vietnam in spring 1975.Contributors to the volume—lawyers, scholars, and government officials—include Dean Rusk, Eugene V. Rostow, Richard A. Falk, John Norton Moore, and Richard Wasserstrom.Originally published in 1976.The Princeton Legacy Library uses the latest print-on-demand technology to again make available previously out-of-print books from the distinguished backlist of Princeton University Press. These paperback editions preserve the original texts of these important books while presenting them in durable paperback editions. The goal of the Princeton Legacy Library is to vastly increase access to the rich scholarly heritage found in the thousands of books published by Princeton University Press since its founding in 1905.